Instead of proclaiming you cannot love your body at this weight, maybe it’s actually an unrealistic expectation to love your body at this weight? Maybe instead…can you ask yourself if you can tolerate your body at this size so you can cultivate a fulfilling life outside of your body? When I think about positive body image I don’t think about loving my body at it’s natural size. To be completely honest, although I was 9000x more miserable and neurotic when I was many pant sizes smaller, I actually liked the physical appearance of my body better than I do now, BUT I would never in sixty billion years want that body again because I would never want to feel so regimented around exercise and food like that again. That is 100% not worth it in my mind. And when I look back on my life 5 or 6 years ago and my life now, my days and months and years are so much richer in this body of mine than they ever were in my teenage and early twenties body. The reason they are richer is because I don’t think about my body much at all anymore. Do I have days where I feel bloated and crappy and my jeans feel snug or I look at a photo and think…”maybe not the most flattering piece of clothing I own..” YES. And I say yes because I’m human and we live in a diet obsessed culture that values thinness and very little body fat. Therefore, having the expectation that I will never have a bad body image day is unrealistic and will leave me frustrated and shameful if I do. But are those days very few and far between. YES. And thank God. I’m really grateful for that. I think positive body can mean loving your body. That’s wonderful. But at risk of being offensive, I do think we can put so much emphasis on loving our bodies, that it can perpetuate this preoccupation with body shape and size. 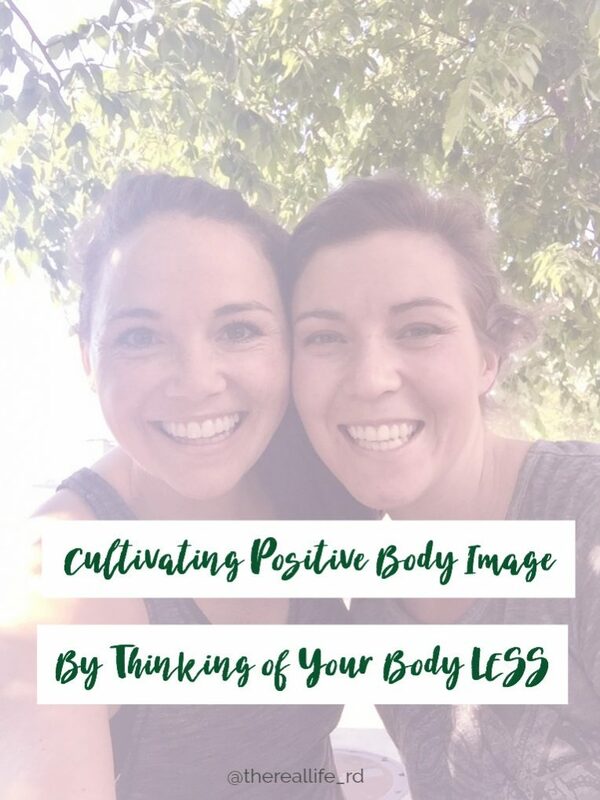 I think positive body image means thinking about your body less. And in order to think about your body less it takes building a fulfilling life outside of your food and exercise habits. Outside of your pant size. And then over time you realize the life you have built means so much more than micromanaging or focusing on your body size. 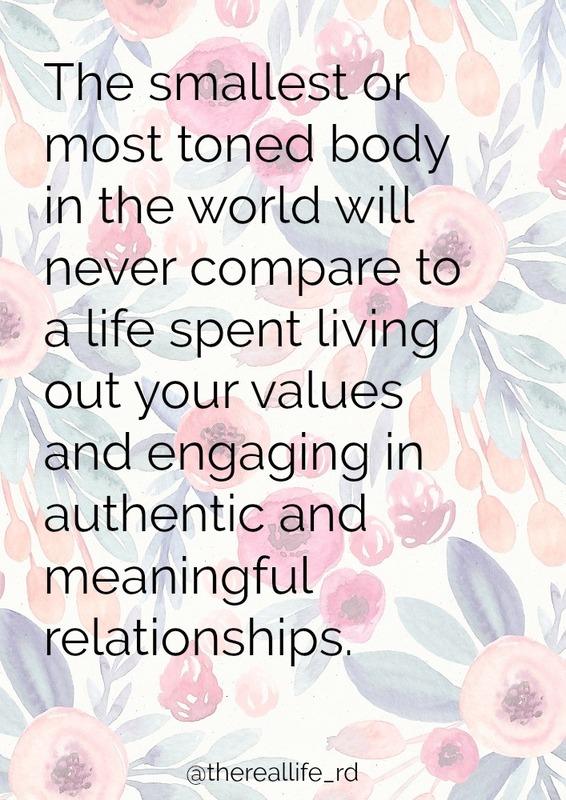 The smallest or most toned body in the world will never compare to a life spent living out your values and engaging in authentic and meaningful relationships. It never ever will, I promise you that. As humans, we were made for connection. We were made to love and care for people and to be loved and cared for. If we spend our days focused on micromanaging our body size, we dampen our ability to love and to be loved. That doesn’t mean we are unlovable – we are lovable no matter what – but we have a hard time receiving that love. As you begin to think about building a fulfilling life, you will feel fulfilled when you are living in line with your values. Maybe you don’t even know your values because you’ve been drowning in diet culture for so long. That’s okay. Perhaps you can give yourself some time and space to process and discover your values? When you begin to put more of your time and energy into things that matter to you most, things that resonate with your soul, things that nudge at the core of who you are…over time your body size becomes much less valuable and much less interesting. But it can take a lot of time. Give yourself lots of space and compassion and grace. I think we can become easily frustrated when we don’t give ourself the time this journey takes. I know I felt that way. I wanted my body image issues fixed right now and didn’t want to have to deal with it. But getting to the other side takes a lot of processing and hard work and wading through the deep and painful waters that have shaped the current narrative of your relationship with your body. Getting to the other side takes sitting with the all consuming anxiety that accompanies your current body size and seeking to understand that anxiety instead of escape it. So you don’t have to love your body at it’s current size. You might not ever love your body at its current size. That’s okay. Maybe that’s too high of an expectation. But can you tolerate your body at its current size? Can you be in your body and not actively try to change it? Can you tolerate that new fleshy pocket on your belly? Can you tolerate the softness of your upper arm? Can you tolerate the fuller look of your cheeks? Give yourself time and space and grace to tolerate. Doing that is a huge first step. To tolerate your body as it currently is and not try to actively work against it is a huge first step. And then maybe down the road, which could be months or years, can you accept your body for what it is? Can you accept it’s natural size? Maybe you don’t love it, but can you accept it? Circle back to your values. How does your body allow you to live out your values? 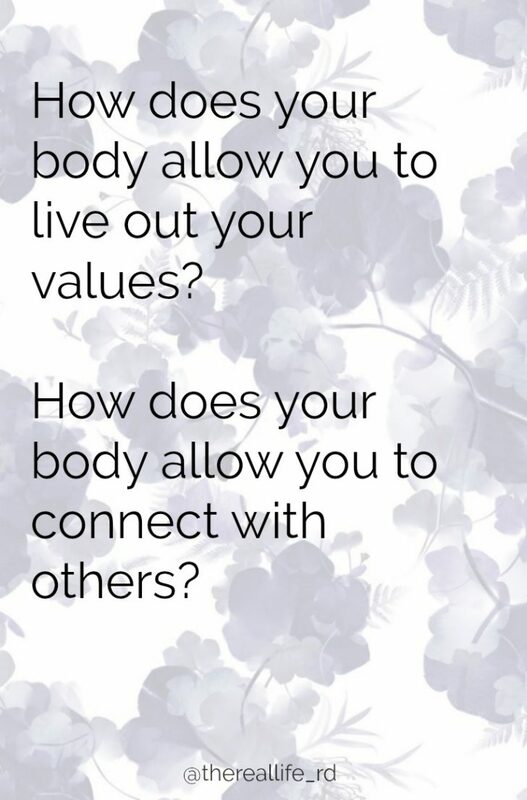 How does your body allow you to connect with others? For me, my natural body size allows me to say yes to spontaneous dinner dates with my husband or a trip to the ice cream shop with a friend. My micromanaged smaller body size wouldn’t be able to tolerate those things without crazy food rules and exercise habits. Accepting my natural body size allows me to be present in conversation. And to be present at the dinner table or at a party. Instead of trying to tally up how many calories I just consumed or wrestle down the anxious thoughts ping ponging through my brain, I’m able to immerse myself in meaningful, life giving conversations. Laughing feels more zealous. Listening feels more refined. Conversations feel more significant. But to get there, I had to – and you have to – build a meaningful life outside of your body. Do you want to remember obsessing about your body or the food you use ate or the exercise you didn’t do? Or do you want to remember the sights and sounds and smells and people and conversations of today? We’re all on our own journey. Just because you’re here and she’s there doesn’t mean anything. It’s okay to be where you’re at. Keep putting one foot in front of the other. And if you feel like you put one foot behind the other, that’s okay too. What can you learn from that? Persistence is the key to freedom and peace with your body. I’d love to hear your thoughts on this and steps you’ve taken to think about your body less. I know other readers will be encouraged by your path! Amen. It is truly freeing when you stop keeping track of every. single. calorie. and just enjoy the food, and life, the Good Lord has provided for you. I recently started letting my workout schedual be more organic and it just happens when it happens. For me, I find that this mindset makes it to where I want to do more. Knowing I don’t have to, but also knowing I feel 100% better if I get some kind of structured movement in my day. 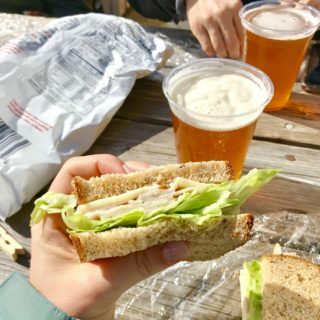 For me personally, I also know that I easily slip into the mindset of having a, b, c dietary restrictions and I’ve eaten this way for such and such length of time so now it must stay this way forever… Over the last year I didn’t eat any meat besides fish. I’m not allergic I just, chose not to… But, recently I realized I was restricting myself and making it harder on myself for no reason. I have come to the conclusion that life truly is so precious and we are here for such a short time that any moment spent worrying of something like that is so silly. Food should never be about what you can’t eat… but, a journey about all that you CAN! Thank you for sharing your story with us. I pray you and Nick have a great day! Robyn, I’ve never met you, but hope one day I can tell you, in person, how much you have helped me. This blog was very much needed today. Thank you. This is exactly where I am right now. I agree with this SO much! Sometimes it feels like adding “i LOVE my body” seems like too much pressure, like it’s another thing i need to be focusing on and doing and always once again thinking about my body (yes, now in positive terms versus negative) but still, constantly thinking about it. Instead, I’m more “neutral” about my body! Some days I look back on pictures of myself and think I looked “better” a few years ago when I was thinner because I could wear a super tight dress or jeans 3 sizes smaller and I miss how my body looks. But I will NEVER go back there because of the obsession it took to get to a size that was not my natural body weight. I will never go back to a time where I would only allow myself one meal out a week and then only if I ran 5 miles beforehand and made sure I only ate half of my plate. Yikes. So even though when I view my body now I’m not always crazy about how things look, that’s okay! 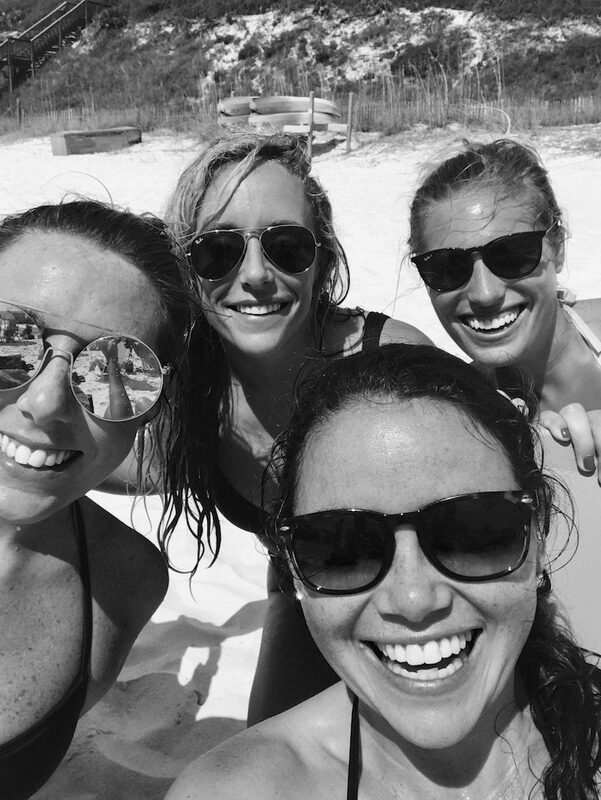 I have so much more to focus on than just how I look in a pair of jeans- like enjoying time with my husband and friends! This was such a great post and a great reminder!! Identifying my values was a big turning point for my recovery. I realized how the nature of an ED is deception, while *honesty* is something I value…Honesty with myself AND others. By practicing this value, I felt more vulnerable than I have in years, but in turn, I was able to really let people in. For me, my faith is based on the concept of being fully known and fully loved. Because I wasn’t allowing myself to be fully known (with an ED and lies), I never felt deserving/worth being fully loved. Now that I live according to my values (honesty being one), it has been life changing. Not only do I love myself more, but I’m finding it easier to receive others’ love too. Like you, I liked the look of my smaller and more toned body, but you know what? I still wasn’t satisfied with that! I am experiencing the freedom of being ok with where my body wants to be. It’s incredible to let it do what it wants! AND it sure is fun eating the foods that I have been restricting for the past several decades. Agreed with this so much Julie. Thank you for sharing that! I will be bookmarking this page for future reference i think. glad it was a helpful journaling prompt! Robyn, this post speaks to me so much and couldn’t have come at a better time for me in my journey. 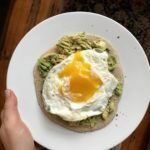 After decades of body obsession, disordered eating, dieting, and a whole lot of shame, I finally started to embark on a journey toward intuitive eating this past spring. But over the last month or so I have been dipping my toes back in diet culture. I don’t want to do it, I want to be OK where I am, or where my body is meant to end up, but man is it hard. I feel guilty when I don’t feel like I can love my body and then I get drawn back to trying to make it smaller before I really become an intuitive eater, which I know is not how things work. 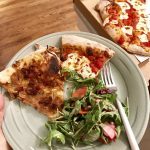 Reading this post was such a welcome reminder that I can learn to eat intuitively and ditch the diets as long as I can work to at least tolerate my body; but that I don’t need to love it and be all rah-rah body positivity, until I’m ready, if ever. Thank you. THIS is 100,000% true. If you are at that natural body size that allows you to be present, to live out those values without micro focusing on calories and exercise and food, that is truly fulfilling. 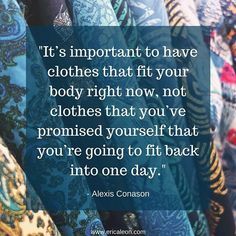 I love that you talked about how your natural body size enables you to not think about your body size, your clothing sizes, or always be body checking. It’s losing that awareness of my body that has been one of the greatest gifts of recovery ever, and those days of bad body image truly do grow fewer and farther between. 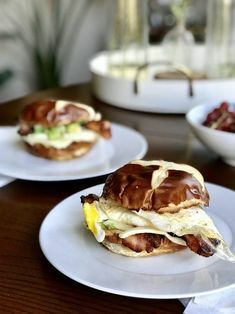 Sadness: it’s hard for me to think back on all of the moments I didn’t fully soak up when my thoughts were consumed with what and how much I should be eating, instead of diving into the conversations and relationships that were in front of me the whole time. Joy: in how far I’ve come in my journey and my last few months of wonderful growth in relationships and self acceptance. Pride: in the realization that I was good enough all along and I’m finally allowing myself to see how strong and beautiful I am for reasons other than physical strength and size. Thankful & FREE: because my mind has so much more space to feel grateful and blessed for the life I have! 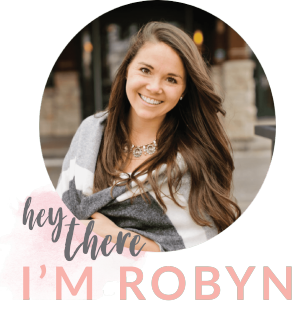 Thank you, Robyn, for creating a space for growth, compassion and love for all of us on this journey! Thank you for your vulnerability in sharing this Karlee <3 I think it's okay to grieve your old self. And to also think about what those years taught you and how much more you can appreciate where you are at. Thank you for sharing!! Thank you so much for this. It seems like all of your blog post topics come at the exact time that I need them. I really look forward to reading your posts each week. You’ve helped me immensely throughout my journey! I think there is a happy medium between spending every minute working out and worrying over your diet (as in the food you eat, not a “diet”) and taking care of yourself for the long run. I’m 52 and just finally figuring that out. I’ve been overweight, and fit and toned. The fit and toned didn’t last though, because the nutrition part wasn’t addressed. So now I am working out more than I was (telling myself a walk and some yoga a few times a week was perfectly okay), and my food is 80/20 with whole, real foods and a pescatarian diet. I lift weights – not crazy, but building and keeping muscle, and practice yoga every day to keep myself strong and pliable. I walk every day as well. Do I not want to do all this some days? Sure! But looking long term, this is what I NEED to do on a consistent basis to grow old gracefully and hopefully without major health issues. Even though I’m not at what I’d consider my “fighting weight”, I can say very honestly that I love my body more now than I ever have in my entire life. Including when I weighed 45 pounds less! Because I’m taking care of myself and I’m healthy. OMG I love you. I live in Boston and I hope to meet you one day !! 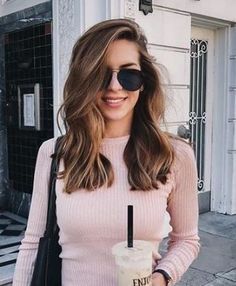 Your posts are so inspiring! Hope to bop into you too! This is so very true. It was thinking about my values and priorities in life that really helped me put my focus of staying smaller in perspective. I knew in life, this actually meant the least to me as compared to other areas of my life: relationships, personal development, career, reading, playing violin etc. But I was spending SO MUCH TIME on this one area of my life, that I had little time to focus on others. It was this fact that really helped me think about why I was spending so much time on an area of my life that meant the least to me. I also really appreciate your transparency in saying that you sometimes actually still preferred your physical body at a smaller size. I think it’s difficult not to in our culture we live in today. BUT, I do think it’s getting better. I see more and more promotion for all types of bodies in the media and less tolerance for those platforms only promoting a thin body. I think it’s super helpful. Great post and well said! I have never commented on a blog before, but I just had to thank you for this post. 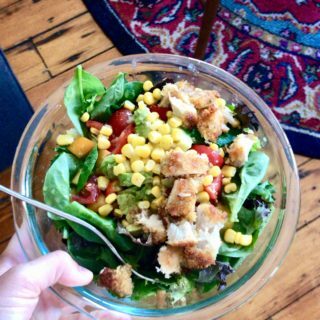 I started my Intuitive Eating journey a few months ago after years of calorie counting / restricting / binging. I absolutely feel more free & open to life now, but I’ve found the body acceptance issues sneaking in — and leading me to consider dieting again. 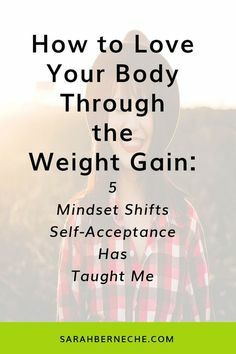 Thank you so much for this perspective — such a great reminder of why I’m doing this and how to get through to body tolerance! Can you do a post on what to do if you are clinically obese and have gained weight trying IE in the past? Even if I try to accept how my body looks, I want to lose weight for my health and I don’t know how to do that when IE led to a 20-lb gain in four months the last time I tried it. I recognize that I have some unhealthy food habits that contributed to that problem, but the only times I have ever lost weight (and then maintained the loss for a long time) have been as a result of structured clean eating. Yes, I would also love to read a post on this topic! This was so so great, thank you! Body image obsession and fear of weight gain is like living in a personal prison 24/7, and the shame that leads to not speaking up about it only perpetuates that isolation! Thank God that it’s never too late to break the cycle. 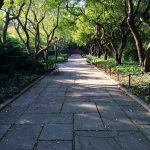 one of the best blog posts I have ever read. resonated so much with me. I barley remember my early 20s because I was so focused on running or eating less calories that I didn’t have room in my mind to make or keep memories. so sad to have wasted those years and so grateful so see how totally unfruitful all that was now. body image still nags at me all the time but I know I didn’t feel good then and I do now and that means the world. also being hangry makes you cranky and I was very snippy those days. I have much more patience with loves ones now. thank you for your honestly and insight. Looking back on my early twenties it’s hard to realize that too, but I try to reframe is as those lows being what helps me to feel and experience this new life so much deeper and be more appreciative because I’ve experienced the other side. so happy for you! thank you! that is a great way to look at it! I am happy for you too. that low point has made me a better friend, RD and wife for sure! I love this 🙂 Persistence really is key. Diet culture is SO persistent, so we must also be persistent as we turn away from diet culture. Really, my ultimate goal is to never worry or care about my body apart from how I feel (such as my energy levels), which is hard since we are told our health and happiness and success and blah blah blah depend on our body size. It isn’t true. So we have to keep tuning out that noise and tuning into spaces like your blog but more importantly tuning into our own minds + bodies + hearts. Have a great weekend! Yes recognizing that we swimming against a strong current is important. Have a great weekend too! I wrote about something similar not long ago and couldn’t agree more. It takes awhile to fall in love with someone, and that includes ourselves. You can appreciate your body and be thankful for your body, but sometimes it’s hard to LOVE it. Love takes time, as does coming to realize that, regardless of your size, you are fiercely beautiful and worthy. What an amazing day it will be when we all finally realize that and spend less time scrutinizing our bodies foe what they’re not and focus on everything that they are. I love, love, love this piece of writing. The direction that so many RD’s are going with body positivity and health at any size is inspiring. Thank you for sharing. This message is so powerful! Thank you for sharing! In my ED recovery and for years afterward, I thought that positive body image was loving my body, which felt like an unattainable goal. Not until this year, am I learning that positive body image isn’t loving your body but accepting it the way it is. You love it by caring for it and giving it what it needs. Thanks to you and Kylie Mitchell, my mindset is changing. I am still far from accepting my body and being comfortable in it, but if I look back over the last 8 years, I see so much progress. As you mentioned – we need to be patient with the process. This was just the post I needed today. I had a weekend of socializing and pictures were taken that I just didn’t love. I also stupidly stepped on the scale this morning (I haven’t weighed myself in a few months) and I then allowed that number to make me feel like crap all day. I totally love the idea of not “loving” our body but accepting it for what it is instead of this constant battle. I agree that in order for me to live this happy and amazing non-diet life I have been living I have to let go of how I look and how I want to look in order to enjoy and to be present and not all consumed with dieting etc. Thank you so much for writing such enlightening posts about this topic. It has really, really helped me. I only recently found your website but all of the topics you bring up seem to align with what I’m struggling with. I’m only just beginning intuitive eating after recovering from an eating disorder and although this is new and uncomfortable I know that once I heal my relationship with food and my body I will be much happier. It makes me sad to think about the countless hours I spent and still spend thinking about eating and my weight. I really want to work hard to regain my period and self trust and I do far your blog has been a great tool to learn from. Hi Regan! I’m so glad you’ve found the blog and the writing has resonated with you – that means so much to you!